The Vetiver and Chamomile ingredients assure you a peaceful spell of time. Naturense, the fragrance of natural effects, is for people who are particular about their fragrance choices and incense ingredients. 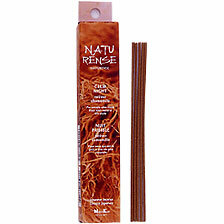 This all-natural incense is blended to create refined moods. Box Size: 1 3/16" X 6 7/8" X 1"